The Recorder is the revised and revived NJCHC newsletter! The first issue addresses the nature of the Commission and its recent publications. It also features a “From the Collection” article discussing the Corrigan diaries and the need for collecting parish histories. The Commission acknowledges its participation in the Archdiocese’s 125th Anniversary exhibit at the Newark Museum. The second issue introduces the Commission with a “Meet the Commission” section and a recent accessions article. “From the Collections” article delves into early Catholic settlements in New Jersey, new publications are announced, and the Oral History program is introduced as a Commission project. The third issue includes “Jersey City Parish Declared Landmark,” “From the Collections,” and “Meet the Commission” articles, as well as news about Msgr. Field’s election and Commission materials on loan to the “Germans of New Jersey” exhibit. The issue also discusses recent accessions and calls its readers to donate any historical memorabilia of New Jersey Catholic History. Articles for this issue include “Meet the Commission,” “Accessions,” and “From the Collections.” A guest archivist column and a re-cap of the convocation of diocesan archivists are also in this issue. 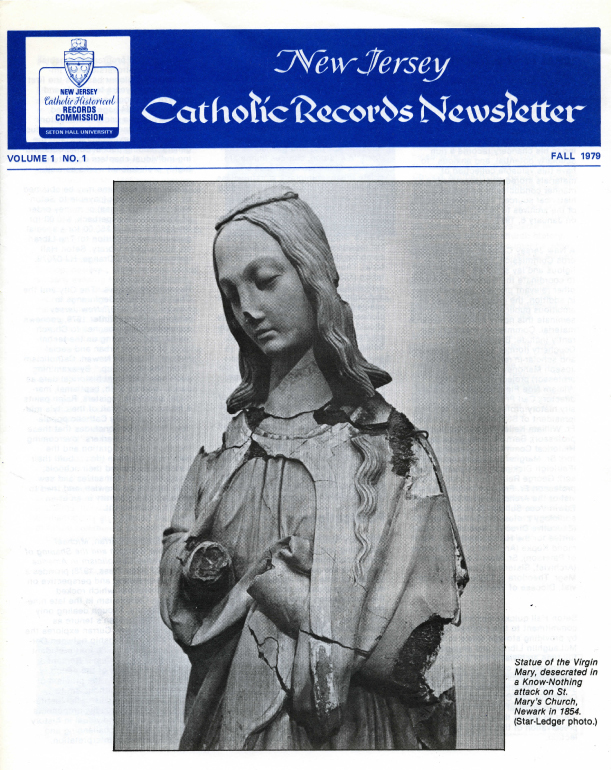 This issue announces the conference “Capturing the Usable Past: Preserving and Interpreting New Jersey’s Social and Cultural History through Catholic Records” to be held on March 21, 1981. The conference agenda is included. An “In Memoriam” article for Rev. William Keller and a “Trenton Diocesan Centennial” are also in this issue. The “Guest Archivist” article in this issue describes the varied archival collection of the Sisters of Charity at the College of Saint Elizabeth. It also recaps the success of the “Capturing the Usable Past” conference and another “Meet the Commission” article. The “Meet the Commission” article introduces Msgr. William N. Field. The issue announces new publications, lectures, accessions, and recent microfilmed records. “From the Collections” overviews the remote Catholic areas of New Jersey like Port Elizabeth. “From the Collections” recounts the fascinating holdings of the Seton-Jevons Papers, as well as an article honoring Mother Seton by the Sisters of Charity and Seton Hall University. There is also another “Meet the Commission” installment and a plea for photograph donations to the Commission. The Commission receives a NEH grant, as described in this issue. Our Lady Star of the Sea Parish is featured in “From the Collections,” and more publications and “Meet the Commission” articles in this issue. “Meet the Commission,” “Accessions,” and “Survey Progress Report” included in this issue. A grant is received from the Knights of Colombus and “From the Collections” features Rev. Q.S. Waldron’s support of Catholicism in New Jersey frontiers. Georgian Court College is also featured as it turns 75 years old. “Meet the Commission” and “Accessions” are included in this issue. “From the Collections” features Msgr. Thomas H. McLaughlin, and the Seton-Jevons Collection opens to researchers. That Oral History Project announces its launch in this issue, as well as an expansion of the archives survey. “Accessions” and “Meet the Commission” installments continue. A grant is received to edit the Corrigan Register and the commission receives donations from the Immaculate Conception Seminary as it relocates to Seton Hall University. The Commission announces a conference on immigration to be held in January, 1984. Further publications are listed, and the “Meet the Commission” introduces Msgr. Francis Seymour. The Commission’s Immigration Conference is reviewed. The accession of parish records is listed, and a parish records guide is made available by the Catholic Records Survey. A member of the Commission, Sr. Margherita Marchione, M.P.F., recently published Philip Mazzei: Selected Writings and Correspondence and presents them to the Commission. New accessions are listed, and Slovak Parish records are made available for scholars. “Meet the Commission” article is included, and a grant is received is for the Corrigan diary project. The legacy of Bishop John J. Dougherty is honored is this issue. The Commission also introduces Joseph F. Mahoney in “Meet the Commission” and new members in “Personel Changes.” The New Jersey Historical Commission presents an Award of Recognition to the Commission for its service and preservation efforts. The history of the Immaculate Conception Seminary and its return to Seton Hall’s campus is featured in this issue. A fund in memory of the Most Reverend John J. Dougherty, S.S.D., D.D. is established, and the Corrigan Journal is to be published. A “Meet the Commission” installment is also included. The Camden diocese is featured in this issue as it celebrates its golden jubilee and the publishing of Building God’s Kingdom, a history of the diocese. A “Meet of Commission” article is included and the Corrigan Journal will be available in December of 1987 from the Commission. The archdiocese of Newark celebrates fifty years since its establishment. The issue focuses on its history and impact. It also features a “Meet the Commission” article, a call for conference papers for a symposium at Saint Anselm’s College, and recent accessions acquired by the Commission. The Commission announces the publishing of the history of the Paterson diocese, Living Stones: A History of the Catholic Church in the Diocese of Paterson, as part of its golden jubilee celebration. The Corrigan Journal is published, and a “Meet the Commission” article is included. The Eparchy of Passaic is featured as it celebrates its silver jubilee. “Meet the Commission,” Commission changes, and new acquisitions are listed in this issue. The history of the Archdiocesan Institute of Sacred Music is featured in this issue. Archbishop Peter Leo Gerety schedules lectures, the Middle Atlantic Historical Association of Catholic Colleges and Universities will hold its conference at Seton Hall University, and a “Meet the Commission” article are also news in this issue. “Caring for the Orphan” discusses the important roles of the Catholic Church in New Jersey social work. “Recent Accessions” and “Meet the Commission” are also included. Msgr. Edwin V. Sullivan is named Prelate of Honor. Archbishop Peter L. Gerety is named Commission chairman, and his qualifications and past are featured in this issue. New Jersey Catholic histories are sought for archival preservation, and the Commission archives has personnel changes as Msgr. William N. Field becomes the Director of the Special Collections at Seton Hall University. “Religious freedom and reform school: a hard sought fight” comprises most of the issue. “Meet the Commission” introduces Sister Thomas Mary Salerno, S.C. The “Birth of Christ The King Parish, Jersey City” looks at some of the first establishments of African-American Catholic parishes in the Diocese of Newark. A “Meet the Commission” installment is also included. This issue highlights the many accomplishments of Seton Hall University’s leaders in the article “’Pirate’ Chieftains.” Gerety Lectures are scheduled and more members are added to the Commission. A small souvenir booklet from 1893 is donated to the Commission from the Church of the Sacred Heart and discussed in this issue. The Commission announces a Black Catholic Symposium and Exhibit and the establishment of an Advisory Board. A “Meet the Commission” article is also included. “Patrick Charles Keely, forgotten architect” discusses the overlooked architect of numerous churches and cathedrals, many of which are in New Jersey. “Meet the Commission” features Sr. Irene Marie Richards, O.P., and new counselors are appointed to the Advisory Board. The Black Catholic Symposium is also recapped in this issue. Msgr. Georgre H. Doane’s travels are described in “Glimpse at a 19th Century Tourist’s Album.” The Commission also lists its available publications and a “Meet the Commission” article. “St. Michael’s Medical Center, Newark: 125 years of service to the community” is featured for its history of charity for the city. The Commission celebrates its 15th anniversary, as well. Very Reverend William McNulty is Paterson’s “Grand Old Man,” and his long service to the community is praised in the featured article. The Commission announces a new book on Hispanic influence and personnel changes. The Commission announces the “Collecting, Preserving, and Writing local Catholic History in New Jersey” conference to be held on March 30, 1993. Mrs. Miriam Murphy is honored for her serivce to the Commission. There is also a “Meet the Commission” installment and personnel changes. The first Bishop of Trenton, Most Reverend Michael J. O’Farrell, is discussed as a true servant to immigrants and orphans alike. 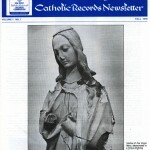 The “Collecting, Preserving, and Writing local Catholic History in New Jersey” conference is overviewed in this issue. The Heritage Institute of the Diocese of Passaic is credited in this issue with preserving the cultural backgrounds of Catholic immigrants during the 19th century. The collection consists of national costume, art, and other insightful artifacts of the many cultures of the Diocese of Passaic. “Meet the Commission” is included, and “Noted with Pleasure” congratulates Sr. Margherita Marchione, M.P.F. on her recent honors from the New Jersey Christopher Columbus Quincentennial Observance Commission. The Seton Hall Battalion is overviewed for its activity during the Civil War to the turn-of-the-century. The Commission also announces personnel changes and recent publications. Sr. Margherita Marchione, M.P.F., a Commission member, is honored for her induction into the New Jersey Literary Hall of Fame. The Commission announces “Carribean Immigrants and the Catholic Church in New Jersey” a conference to be held on March 12, and the publication of Upon this Rock, a history of the Trenton Diocese. “A Teaching Bishop- James A. McFaul of Trenton” describes the educational and humanitarian efforts of an early bishop of Trenton and the problems that he sought to eliminate during his service. Reverend Monsignor Joseph M. Flynn made great contributions to Morristown, as described in this issue. “African-American Catholics Flourish at St. Peter Claver Parish” is a retrospective of the Catholic community in Montclair. This issue also announces recent publications of interest and the rescheduling of the Carribbean Immigration conference. An archives grant was also received for the preservation of the Bishop Winand Wigger Letterbook. The Commission anticipates the conference in November. The schedule is included. Kevin A. Gugliotta wins the Gerety Award, and more Gerety lectures are scheduled. Sr. Marghertia Marchione, M.P.F. recently published Peter and Sally Sammartino (Biographical Notes) is available. The success of the Immigration conference is overviewed. Recent publications are listed. “Neglected Historical Riches- Cementary Inscriptions” evaluates the historical importance of deteriorating Catholic gravesites. “Women Religious in New Jersey” describes the invaluable service of Catholic Sisters in the history of the Catholic Church in New Jersey. A conference on this topic is announced for October 25. There is a “Meet the Commission” installment, and work of the sculptor Brian Hanlon is to be shown in Walsh Library Gallery. The Commission reminds its readers of the Conference on Women Religious and Ministry in New Jersey. The conference program is included. One of the founding members of the Commission, Msgr. Edwin V. Sullivan retires. The letterbook of Bishop Winand Wigger is featured and pictured in its reconditioned state thanks to a recent grant to the Special Collections Center at Seton Hall University. The Conference on the Ministry of Women Religious is overviewed. A Commission member, Bernard Bush, is honored by the New Jersey Historical Commission. Recent publications of interest are listed, and the archives acquires a photograph collection. Saint Francis Hospital in Trenton is reviewed for its service to the community. “Save the Date” announces the Commission’s next public program “Writing Parish Histories” to be held on September 28. Commission member Sr. Margherita Marchione, M.P.F. published Yours is a Precious Witness: Memoirs of Jews and Catholics in Wartime Italy, which defends Pope Pius XII. Other publications are also listed as available through the Commission. The “Writing Parish History” conference is overviewed as a success. “The Sisters Come to Saint John’s, New Brunswick” recalls the sisters involvement with the school, church, and German Community in that area after the Civil War. The Commission announces personnel changes and the speaker for the next Gerety Lecture, Prof. Philip Gleason of Notre Dame University. An article on Saint Michael’s Cathedral in Passaic overviews its humble beginnings and importance to Byzantine Catholics of New Jersey. A “Meet the Commission” installment is included, as well as a requiescat in pace for a founding member of the Commission, Prof. George L.A. Reilly. The New Jersey Historical Commission awarded a grant to the Commission for the publication of New Jersey Catholicism: An Annotated Bibliography by Father Augustine Curley, O.S.B. “Early Days at Holy Trinity, Westfield” examines the efforts of a small, but growing Catholic community. “Meet the Commission,” recent publications, and a “Save the Date” for the annual public program is included in this issue. “ A Tempest in Trenton: The Great Controversy upon Catholicism and Protestantism” discusses 19th century nativism and prejudice against Catholic immigrants. The Commission formally announces the conference on Catholic Education in New Jersey for April 25, 1998. The schedule and registration form are included in the issue, as well as a “Meet the Commission” section. The conference on Catholic Education is reviewed. More Gerety lectures are scheduled for the upcoming year, and new publications are listed. Rapid urban expansion and immigration in the 19th century called for new parishes to be built, as described in “Building Churches on New Jersey’s Northwest Frontier.” A “Meet the Commission” article and the announcement of the next Gerety lecture, “Catholicism and Race in the Twentieth-Century Urban North” by Prof. John T. McGreevy, are included in this issue. Sacred Heart and Holy Family parishes of Camden celebrate anniversaries, and the histories of these churches are elaborated on in this issure. “Meet the Commission” is included, as well. “St. Thomas the Apostle Byzantine Catholic Church and its Role in Byzantine Catholic Awareness Day” enumerates the many services the church did for 19th century immigrants and for the community, today. More Gerety lectures are announced, and Ad Multos Annos is included honoring Archbishop Gerety’s 60 years of priesthood. The Commission announces that New Jersey Catholicism: An Annotated Bibliography will be available soon. Archbishop Gerety is honored for his past service to the Commission and to the Catholic Church. A “Save the Date” is included for the next conference “One Hundred Years of Catholic Higher Education for Women in New Jersey” to be held on March 25, 2000. The Commission formally announces the program on Women’s Higher Education. The schedule is included in the issue. Continuing with this theme, “The College of Saint Elizabeth: Glimpse Into Its Past,” looks at the Catholic Church’s involvement in establishing four-year colleges for women with special emphasis on the College of Saint Elizabeth. The “Catholic Higher Education for Women in New Jersey” conference is reviewed. Recent articles written by Commission members appear in New Jersey History. A “Meet the Commission” article is included, and the announcement of Msgr. Giglio’s retirement. The article “Some Catholic Military Involvement Throughout the Years” highlights the service of some New Jersey Catholic chaplains in the U.S. Military. “Meet the Commission” and recent publications are included, as well. This issue sadly announces the death of Msgr. William N. Field, a founding member of the Commission, and Prof. Allan Nelson. The issue is dedicated to describing the lives and legacies of these members. The Commission also announces publications that are still available and a need for information on the history of the underground railroad in New Jersey. “Appeal from China to New Jersey Issued 64 Years Ago” outlines the plea to the archdiocese of Newark for relief and resources during the beginning of WWII. The Catholic missionaries in China had established a strong religious community, but were suffering in the war with the Japanese. New members join the Commission, and it establishes a history prize in honor of Msgr. William N. Field. “Meet the Commission” introduces one of its new members. The Commission turns 25 years old and celebrates its anniversary and accomplishments in this issue. A “Meet the Commission” installment introduces a new member, as well.